The Barton Arcade, backed by Limerick based investor Morgan Leahy, has added its eclectic mix of independent and designer fashion outlets with the addition of high-end names such as Ed Hardy, Jeffery West, Elvis Jesus and Ringspun. With its wining combination of choice and location within the heart of Manchester’s dynamic shopping district, Barton Arcade is an essential stop on any shopping adventure. Even during a recession it is critical that businesses expand and change to continue to meet customer needs. This has been the case for DPD Ireland, who have increased the number of depots located in Northern Ireland from five to seven in recent months. In April, in partnership with Les Lang’s Infinity, the company completed the £6m purchase and leaseback of 53 King Street. 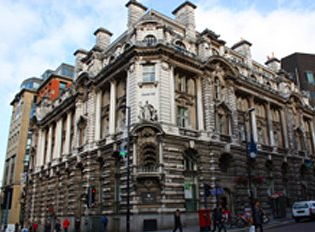 The building, which had been owned by Lloyds bank for more than a century, is one of the most architecturally notable in central Manchester. The firm was founded 12 months ago by former Ask Developments director Stephen Cliff and Irish investor Morgan Leahy. Although the charismatic Leahy, who made his money in Limerick’s haulage industry, is well known on the Manchester property circuit, the public face of the business is Cliff’s. It was in 2005 that Cliff first worked with Leahy, who had just bought the Bauhaus office, hotel and residential block in Quay Street from Ask for around £15m. In 2007, Leahy sold Bauhaus for a £7m profit to Blackrock, formerly Merrill Lynch Investment Managers. 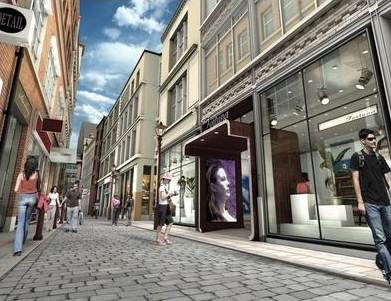 In the same year, Leahy paid £17m for Barton Arcade and £12.7m for the adjacent Lancaster Buildings, both comprising shops below offices, and both now part of the Vision portfolio. Leahy also agreed a £2m sale of the Lancaster Buildings’ office element to Maple Grove. One of Manchester’s most beautiful, but unsung historic buildings, has been secured by some of the region’s brightest new talents. In their first joint venture, Infinity’s property fund and Vision Developments have completed the purchase of 53 King Street in central Manchester. The £6 million purchase sees both organisations securing an equal share in the property, which houses Lloyds TSB. The building totals 43,000 sq ft, and includes a large banking hall on the ground floor. 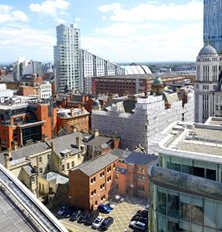 Lloyds TSB currently has two years remaining on the lease, providing Infinity and Vision Developments with an attractive income in a prime central Manchester location. 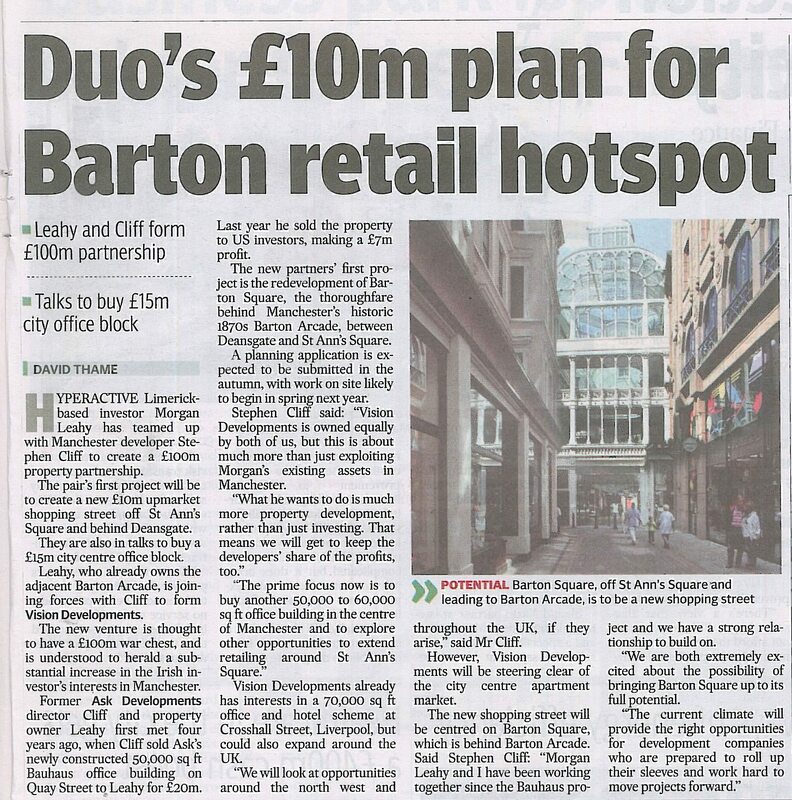 Morgan Leahy, co-founder of Vision Developments added “We saw this as an extremely rare opportunity to acquire a landmark building in the city centre. The purchase price, which equates to an initial net yield of 12%, would have been unthinkable 12 months ago. Infinity and Vision have worked alongside a number of partners on the deal. These include: commercial real estate agents Knight-Frank led by partner Steve Carrick, and solicitors Brabners Chaffe Street led by partner Mathew Dobson. Stephen Cliff and Morgan Leahy’s Vision Developments has bought the freehold interest in Invicta House, Manchester, from Maple Grove Developments. The site, which is within the Spinningfields district, is around 10,000 sq ft. The price was not disclosed but the site was marketed with a £3.5m price tag by Christopher Dee. Vision, which already has two development projects under way in Manchester and Liverpool, said the building had ‘excellent development potential’. VISION Developments, the company set up with backing from Limerick-based investor Morgan Leahy, has made its first major purchase in central Manchester. Vision led a consortium which paid around £3.5m for Maple Grove Developments’ Invicta House in Atkinson Street, close to the 4m sq ft Spinningfields development. The 10,000 sq ft building overlooks the Royal Bank of Scotland headquarters on Hardman Street. Plans for redevelopment will be unveiled soon, says Vision. Hyperactive limerick based investor Morgan Leahy has teamed up with Manchested developer Stephen Cliff to create a £100m property partnership.